I hope you've all had a pleasant day. We've had a restful one which IMO is the best kind. Looks like gifts were a hit this year with daughter. She's particularly enjoying something very similar to this and this. I'll post more (maybe even with photos!) as the week progresses. No pictures today! Sorry, but I'm not in a picture taking mood. 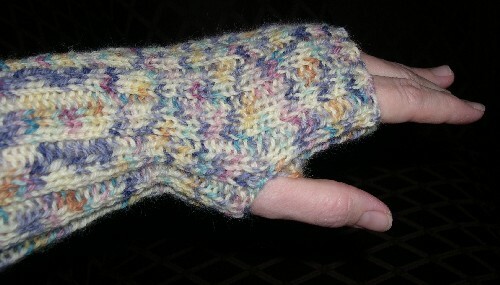 I've finished knitting and felting a pair of mittens for a friend of daughter's. No, this was not Christmas knitting which I swore off this year. 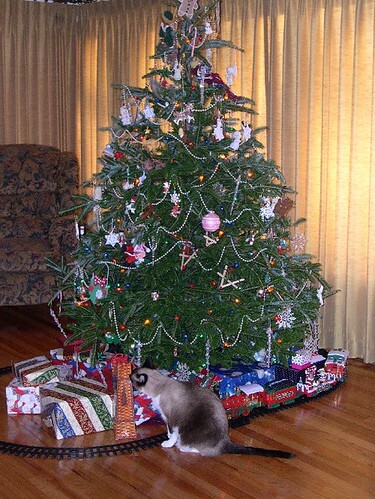 These are just gift mittens with no deadline. I knitted some mice a few months back with some of my hand spun. I finally got around to hand felting them last night. I need to stuff them, add catnip, and stitch up their bottoms. 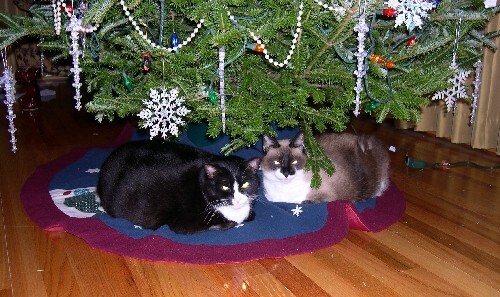 Santa asked me to make these for the cats, as they have been exceedingly good cats this year. Christmas eve is my cookie baking time, and true to form, I baked this afternoon! I made a batch of my chocolate chip/coconut/oatmeal/rice crispie cookies. The house smells yummy! I have sugar cookie dough in the fridge and hope to find helpers to bake some cut out cookies. I would love to have spent the day knitting in my recliner, but firebug husband has the downstairs so fecking hot that we should be walking around in swimsuits! He's developed a passion for our new wood stove, and in spite of the temp being over 60 degrees today, there's a roaring fire going. I cannot bear to be down there, as there is no way to turn down the thermostat on a wood stove. I had to go sit out on the deck to get some relief! I wanted to share some photos taken in our living room. Here are a couple of views of our tree. 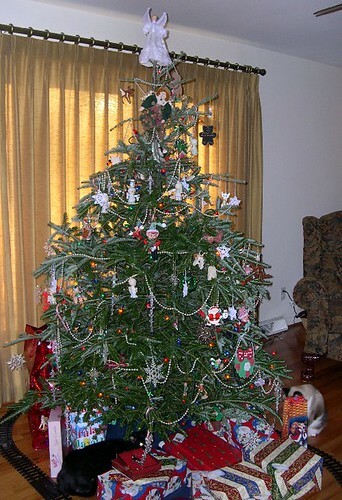 We have a little train set that runs around the bottom of the tree. Daughter has always loved the train! We have quite a collection of Precious Moments ornaments, too. Daughter has one for every Christmas since she was born. They really are pretty. 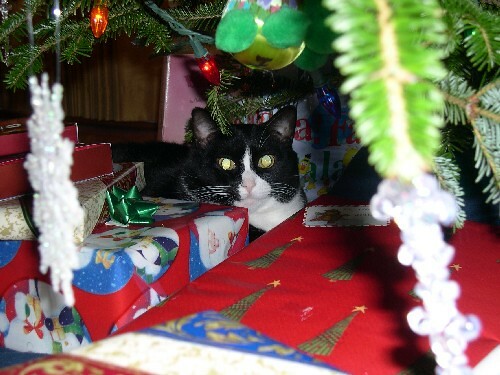 Look who's hiding among the gifts! Here are some ceramic houses that have been given to me over the years. Teddy is wearing a sweater that I made for her, and she's sitting in a rocking chair that was completely hand made by my dad and grandpa (Daddy's dad). They made the chair for Daddy's first grandchild (my daughter) before she was even conceived! Both Daddy and Pappy have passed away. This chair is a treasure to me. This is the new cocktail table I got recently. 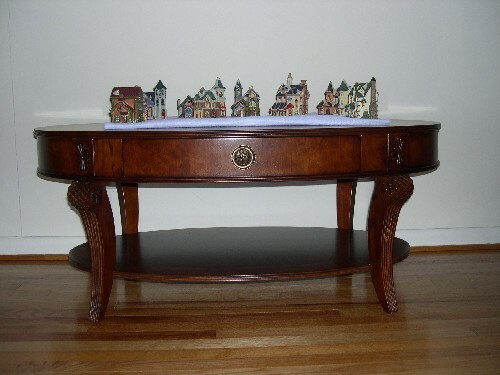 Sitting on top is my collection of miniature ceramic buildings. Daughter arranged them. 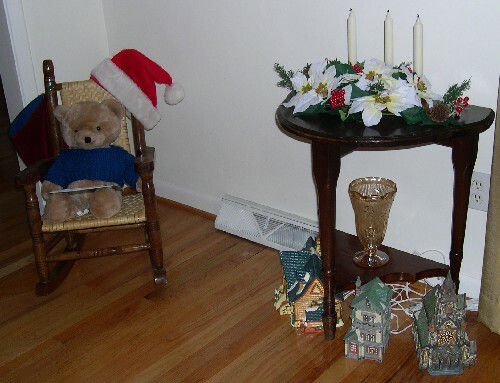 This is my nativity set collection. I'm not especially religious, but I thought these were beautiful. We survived the family Christmas gatherings this weekend. YAY! They were actually fun, believe it or not. I just don't care for crowds or "obligatory" anything, so that was part of the whole dread factor surrounding this past weekend. Yesterday, my side of the family (mom, grandma, brother, and brother's GF) came to see us. We had a nice time, and I was sad to see them leave. I had a ton of food cooked, and they brought more. We hardly made a dent in it, so I've frozen away some things for next weekend. We had our first fire in the fireplace here at our new house yesterday. Once husband got the logs positioned so that the smoke went up the chimney rather than into the room, it was nice! :) I'm surprised at how well the fire warmed the whole upstairs. Tomorrow, our new woodstove is being installed in the fireplace downstairs. I can't wait! We have enough wood to last us through the rest of the winter and possibly beyond, so we hope the stove will warm the whole house. On Saturday, we paid a visit to Hook 'n Needle on the way to see the in laws. Some people drink to survive family gatherings, we buy yarn. We got some Nature Spun and Cascade 220 for felted slippers for husband and me. I picked up a skein of Opal Petticoat. 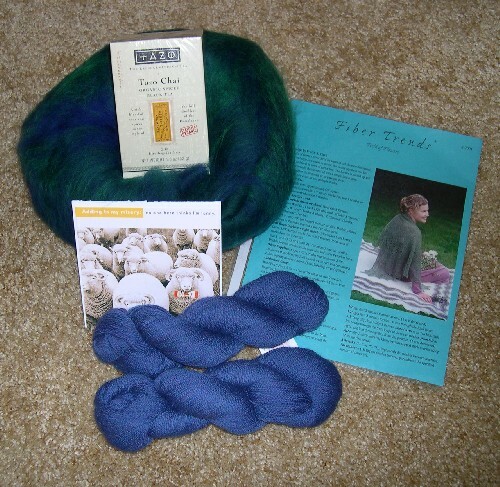 I had no idea it was a hard to find yarn until I read that on Liz's blog. I just thought it was pretty and decided to get it! I also found Opal Handpaint yarn in the clearance bin for $5 a skein. I got three skeins with plans to make a shawl with it. The color that was on sale is number 21, the yellow and brown mingled color. It reminds me of an over ripe banana, but I thought it was cool! The best part about the visit to Hook 'n Needle was seeing Beverly! It's been so long! We also go to see her beautiful little felted ballet slipper pictured in her December 11 blog post. It was even more gorgeous in person! Daughter has her second two exams today and her last one tomorrow. Did I mention this kid has cumulative exams this year?? OMG! I hope she's done well. She gets out of school for the Christmas break tomorrow. I think she's tired and ready for some time off. I know I am! Daughter has her first exams starting on Friday. They are cumulative exams. She's in seventh grade. I'm freaked about it, but she's as calm as can be. English and Science exams are Friday, Spanish and Math are Monday, and History is Tuesday. Her Christmas break starts on Tuesday after the exam. My Christmas break starts on the 23rd and lasts until January 3rd, the same day daughter returns to school. I'm looking forward to some family time. I received a lovely package last week from my SP now known to me as the dear alerievay. She sent some lovely lace weight yarn, a shawl pattern for the yarn, a box of my favorite chai tea, and some of my favorite spinning fiber. Thanks, alerievay for being the best SP! Here are a couple of FOs...well, partially finished objects! Both the sock and the voodoo wrist warmer need mates! 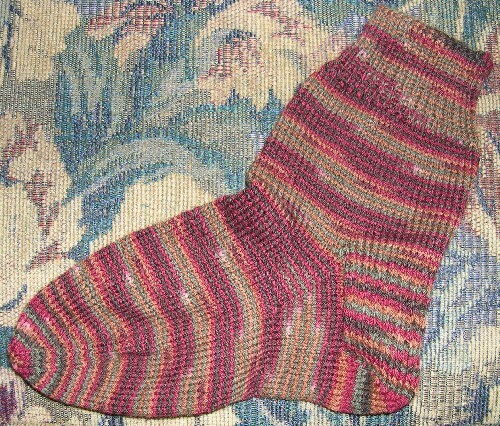 The sock is made from Knitpicks Sock Landscape in Redwood Forest. The wrist warmer is made from Schoeller and Stahl Limbo. Please meet one of the newest additions to our family. 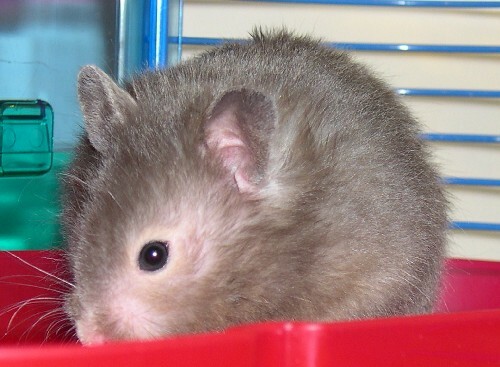 This is Sable, and she's a long haired hamster. Sable is a sweet little animal and already quite tame. She will crawl into my hand for a treat and has even started getting into my hand just to be petted. Sable lives in my office and sleeps most of the day. I'll try to get a picture of daughter's Sweet Pea soon! Husband and I celebrated our 18th wedding anniversary yesterday. That's quite an accomplishment these days, I think. We've been together for a total of 22 years through thick and thin, good and bad. I'm looking forward to growing old with this man. He's the best! It's off to work I go this week. It hasn't been so bad. Monday was sheer hell. First, there was the convincing myself that I really had to do it. Second, there was the wading through 300 plus e-mails and dealing with "issues." I don't have problems at work; I have issues. LOL! I've actually done a fair amount of knitting but have not managed to document this on the camera. I completed an adorable baby hat for one of my employees. It's adorable if I do say so myself. I also finished the looooong scarf for my brother. It needs blocking. Finally, I finished the first sock of my Sock Landscape socks. If you've not tried that yarn, please treat yourself to some. It's inexpensive but so lovely to work with. Daughter dear has a dance to attend at school tomorrow night. I'm hoping that husband and I can find our way to a coffeeshop and book store for a little relaxation. Too bad the LYS isn't open on Friday nights.